Earlier this month, the Community & Natural Resources (CNR) division of the American Samoa Community College (ASCC) demonstrated the Samoan practice of talimalo (receiving visitors or hospitality) during the 2014 Annual Pacific Island Forestry Committee Meeting from March 4th through 7th. 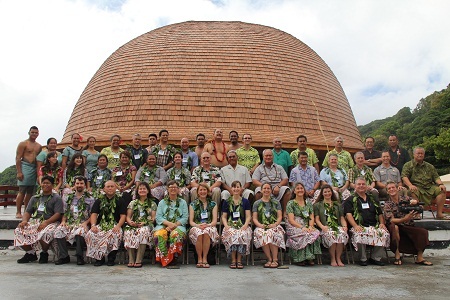 The meeting, a first for American Samoa to host, took place under the aegis of the ASCC-CNR Forestry Program and focused on the theme of Invasive Species and Climate Change. According to participant Caitlyn Pollihan, Director of the Western Forestry Leadership Coalition, the theme highlights the two core issues being faced by foresters throughout the Pacific region. ASCC-CNR Forestry Program Manager Mary Taufete’e explained meeting’s objective as “sharing experiences, ideas and success stories from which to gain knowledge and techniques for improving the sustainability and health of Pacific Island forests." The Committee consists of foresters from American Samoa, the Commonwealth of Northern Mariana Islands (CNMI), Guam, Hawaii, the Federated States of Micronesia (FSM), the Republic of the Marshall Islands, and the Republic of Palau -- all of whom fall under Region #5 of the U.S. National Forest Service. Foresters from these American Pacific jurisdictions attended the meeting, as well as Vicki Christiansen, Deputy Chief of the U.S.F.S. in Washington D.C. and Sherry Hazelhurst, Director of the Region #5 Office. The Committee also welcomed participation from the Independent State of Samoa, represented by the Director and a staff member from South Pacific Regional Environmental Program (SPREP), based in Apia. Local participants included staff from the National Park of American Samoa and the Natural Resource Conservation Service (NRCS) in addition to the hosting CNR- ASCC Forestry Program staff. A traditional Samoan ‘ava ceremony at Maota o Toe Timata le Upega, the Samoan meeting house at the Malae o Suigaula in Utulei, officially opened the event. The meeting continued in the Lee Auditorium over the next four days, with sessions on topics such as invasive species control, biosecurity, forest action plans, climate change and sea level rise, presented in relation to forestry work in the islands. Sherry Hazelhurst, Director of the U.S. Forest Service Pacific Area Office, said the meeting offered “a forum for sharing and developing ideas on how foresters in the region can improve outcomes in forest sustainability and health, while raising awareness about funding, technical support, and training programs to help participants implement critical forestry projects.” Hawaii State Forest Manager Sheri Mann highlighted the benefits of the international exchange of ideas, such as Hawaii adopting New Zealand’s protocol for preventing the introduction of invasive tree and plant species. American Samoa leads the Pacific for the eradication of the invasive tamaligi palagi (Falcataria moluccana) and the Panama rubber tree (Castilla elastica), which crowd out valuable native Samoan forest species like ifilele (Intsia bijuga). So far in American Samoa has treated 2,800 acres and eradicated over 8,000 invasive trees. A mid-week tour of the island for participants featured visits to National Park and NRCS sites in Vatia and Fagasa, including the National Park’s tree nursery. The same evening, an MOU was signed between the ASCC Forestry Program, The U.S. Dept. of Agriculture’s Natural Resource Conservation Service, the US Dept. of Agriculture, the Forest Service, and the American Samoa Soil & Water Conservation District. This MOU strengthens cooperation among partners to better protect, conserve, and enhance benefits from American Samoa’s private and communal (non-federal) forest and agro-forest lands. The expected benefit will be increased collaboration among partners on forestry related program delivery in American Samoa. On the final evening of the meeting, Lt. Governor Lemanu Mauga and his wife Pohakalani hosted a dinner for the participants, with the faletele in Utulei again as the venue. During his speech, CNR Dean/Director, Tapa’au Dr. Dan Aga provided cultural insights into Samoan architecture, in particular the arching inside roof of the fale tele, describing its symmetry as a cultural principle also reflected in the system of Samoan gift exchange. Tapa’au referenced the use of many local trees in the construction of the building, emphasizing the need to continually renew the connection between Samoan culture and natural resources, especially the forests. The evening concluded with gifts presented to the PIFC participants as well as to the Lt. Governor and his wife. Most participants at the meeting expressed that they genuinely enjoyed the entire event. Sheri Mann cited this meeting as the best of the 14 she has attended. Certainly the quality of the hospitality impressed the visitors, from the giving of ‘ie lavalava and ula laumaile before entering the fale tele for the ‘ava o le feiloaiga to the additional gifts they received on the final day. The participation of the American Samoan Government lent the meeting important significance, as it underscored the value our Territory gives both to our traditions and our environment.